Sometimes a book comes along and you want to go to the doors of every school and hand out copies of the book. It's usually a book that's timely. A book that is important to hold conversations and discuss. A book where students can see themselves within the pages, yet also learn something about someone else. From the publisher: Follow a group of children through a day in their school, where everyone is welcomed with open arms. A school where kids in patkas, hijabs, and yarmulkes play side by side with friends in baseball caps. A school where students grow and learn from each other's traditions and the whole community gathers to celebrate the Lunar New Year. All Are Welcome lets young children know that no matter what, they have a place, they have a space, they are welcome in their school. See, I already know how important this book is going to be because I could have used it last year. I got to spend time in a 4th grade class doing #classroombookaday. The teacher and I spent time selecting books that had to do with community so at the beginning of the year we could set the foundation for cooperative and respectful learning. I thought we did a great job. But then something happened that reminded me we needed more conversation. We were doing some learning around the theme that working together we can do more. The kids had a short video clip to watch and take notes about and then discuss. The video takes place in a market somewhere in India. The sights are different - it's a busy urban, outdoor market that is congested with people, cars, and other modes of transportation. The sounds are different - Indian music is playing, you can hear people speaking in a different language. It felt very unfamiliar to our students. So you know how they reacted? They laughed. They didn't know what to do when something was so different that they didn't know how to process it. What did our community books look like? Did they have characters that looked like us? Did the situations in the book look and feel familiar? The students weren't being rude when they laughed, they just didn't know how to approach a new and different situation. What books could I use to help with that? After that lesson, we scratched our previously planned bookaday picture books and went with some new ones. Books that looked and felt different. We were able to have conversations and ask questions. We learned the importance of initial reactions vs taking a minute and thinking about the situation first. That is why I think a book like this is going to be important. It takes a common experience, but makes it look and feel different, but lets the readers know it is ok. 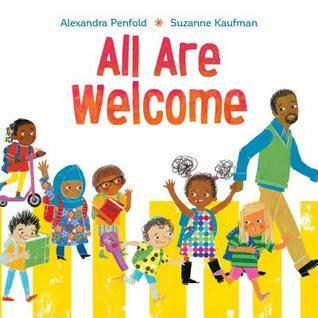 Using the refrain "all are welcome" lets the reader know that while you see differences, it's ok. The common experience for all of the children in the book is school, yet every student brings their own unique experiences to school, so it's a relief to know that all are welcome. This book shows it's ok if things look different to us. It's ok if things sound different to us. In this situation, at school, we're welcome. Discussions can be had about how to approach differences, how we can ask questions so we can understand. What a positive reaction is when something looks different, sounds different. Don't miss the note at the beginning of the book that talks about the origin of the book. I love how the author and illustrator came together to make this into a story all of us can share with students. And I love the poster that is behind the book jacket. I think this book may lose its book jacket in many classrooms so the poster can be proudly displayed! I really hope that every classroom, every library, has a copy of this book. I hope that all students have the chance to read, share and discuss this story. Thanks so much Michele for sharing your experiences. I would love to know the titles of the books you choose to read that looked and felt different to engage students in thoughtful conversations. Can't wait to bring this book into my classroom, so happy you posted. Will be moving to grade 5 and can't wait to use this as a jumpstart! This just sounds amazing. Yet another reason I love our online book community - my small town community would probably never have heard of this, but I'm going to at least get a copy into our school library.